The DS161 combines power with wide angle coverage to give you the most bang for your buck. The quality of light is exceptional due to a round flash tube and custom powder coated reflector designed specifically to deliver the softest, most even coverage possible. This kit provides everything you need to add a strobe to any Ikelite compact or DSLR TTL system. Instead of a simple focus light, the DS161 includes a super even, 500 lumen video light. The light is suitable for close-up, macro, portrait, and wide angle fill-in work or as a focus assist light. Output is adjustable in 10 brightness settings plus an SOS mode for emergency situations. Automatic shut-off when the flash fires ensures that the video light will have no undesired effects on still photos. State of the art Li-ion battery technology produces over 450 full power flashes at an unprecedented 1.4 second recycle time. Our proprietary quick-release toggle system attaches the battery pack with ease and confidence, making a flooded battery virtually impossible. The size of the DS161 is uniquely balanced to its weight to provide near neutral buoyancy in salt water. 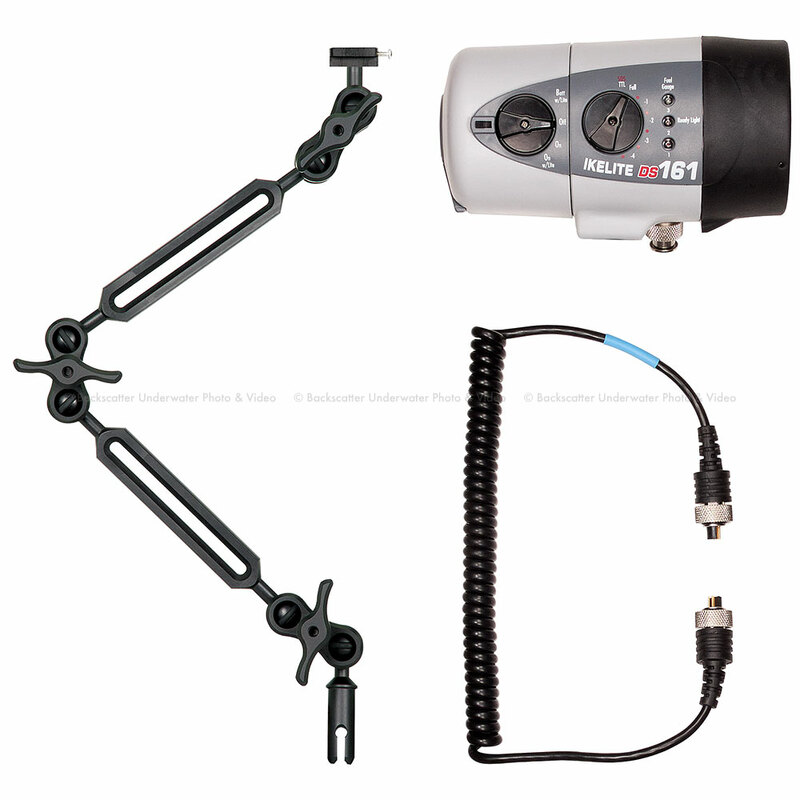 This kit includes our most versatile strobe arm consisting of the strobe mount, three clamps, two 7-inch (18 cm) extensions, and mount to Quick Release Handle. Overall extended length of the arm is approximately 15 inches (38 cm). The two segment arm is easily adjustable on-the-fly and perfectly suited to any shooting scenario from macro close-up to super wide angle. Our Ball Arm System Mark II provides opportunities to mount an additional lightweight accessory almost anywhere along the length of an arm. The 1-inch Ball Arm System Mark II features 1-inch ball components with a groove and o-ring to prevent slippage for improved holding power with less force. While underwater, clamps may be finger-tightened to keep lighting in place yet allow repositioning without loosening the clamp. All parts are hard coat type III anodized for a long lasting, scratch resistant finish. Ikelite 1-inch ball components are compatible with most 1-inch arm system components from Aquatica TLC, Ultralight, Nauticam, and others. To shoot dual strobes, combine two kits with a compatible TTL Dual Sync Cord. Unlike the standard TTL Sync Cord, the TTL Dual Sync Cord is "Y" shaped with one straight cord to the housing and two longer, coiled cords for the attachment of two Ikelite strobes.